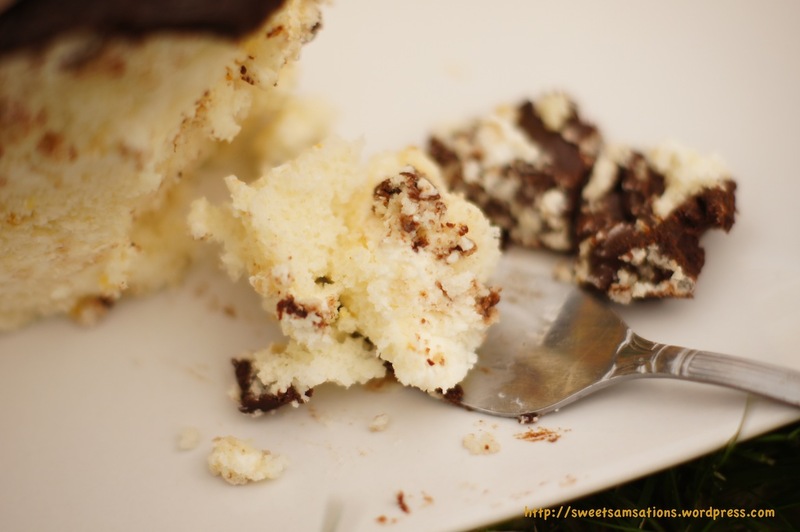 Here’s an incomparably light and tasty cake, the chiffon! I love chiffon cakes because of its soft and moist texture, and its ability to retain it even after being refrigerated. This added lightness is given by the use of vegetable oil in place of butter. It was discovered by a Hollywood insurance salesman Harry Baker, who then later sold his recipe to General Mills. This was my first time making a chiffon and I wan’t sure what to expect! All I knew was that Chiffons are notoriously hard-to-perfect cakes. After making this, I don’t know if I could ever go back to making regular sponge cakes! The separate-egg method combined with the oil replacement really brought out the sponginess in any sponge cake! If you’ve never tried this before, you definitely ought to! My very first Chiffon - Orange! I decided to make the Orange Chiffon, which is a popular flavour in Malaysia. I’m not sure if it’s as popular in Singapore, as I only seem to recall eating lots and LOTS of Pandan Chiffons as a kid. Unfortunately I was also pretty oblivious of food back then, and so now an Orange Chiffon would seem pretty exotic to me! Ironic? I must say.. Looking through many different recipes, I settled on Poh’s, a traditional Malaysian chiffon with a dressed-up Aussie twist! Like most Southeast Asian chiffons, the recipe tended to lend less flour (100-150g) compared to a typical American chiffon (225g). Here is my modification of the recipe. For video instructions, please see Poh’s website! I was curious as to how well the Chiffon would rise. Poh’s did not seem super tall like some I’ve seen, but since I’m layering it with whipped cream, so perhaps a shorter chiffon would work better anyway. P.S. Chiffons taste awesome even by themselves, but I was sure ganache and whipped cream were great additions! You wanna know what’s the most painful part about this recipe? Cracking and skinning the damn hazelnuts!! I took about 2 hours to crack what seemed like a million hazelnuts, just to get 1/2 a cup of hazelnuts. It’s so painfully deceiving I tell you! At least for pistachio, the nuts are almost as big as their shells. However, in the case of hazelnuts, they were so pathetically tiny after removing them from their shells. Deskinning was another issue altogether! I tried both the roast-and-rub-with-towel method as well as the boiling-with-baking soda one and still couldn’t get their skins off them. After much struggle with these NUTbags, I decided to just use my ready sliced almond nuts instead. Yep. I’m sure there’s a much more efficient way to prepare these, but I’m swearing off hazelnuts for now. AARGGHHH! No wonder Ferrero® Rochers are so expensive. NOTES: There are 2 components to the cake. Whites and Yolks mixture. This is the most efficient way to make it such that you don’t need to do too much cleaning up. Like Poh, I whisked the egg whites mixture before doing the egg yolks mixture. This way you don’t have to keep washing your bowl and pedals. However, you need to prepare the yolks mixture quickly enough that your white mixture doesn’t sit for too long! Therefore, all your ingredients should be measured out first! EGG WHITES MUST BE IN ROOM TEMPERATURE!! In a large bowl, beat the egg whites and cream of tartar with an electric mixer until soft peaks form. Add the sugar one tablespoon at a time and beat thoroughly after each addition until you achieve stiff peaks. It is imperative to reach stiff peaks which will produce a tall chiffon. Set aside. In a separate bowl whisk egg yolks with extra caster sugar until thick, pale and fluffy. Add coconut milk, vegetable oil, orange juice and zest, flour and baking powder, and whisk until combined. Gently fold the egg whites into the yolk mixture three batches. Do not stir. Pour into an 8-inch ungreased angel cake tin. It is important that you do not use a non-stick tin and do not grease it. Bake for 30 minutes on the middle shelf, or until a skewer inserted in the centre of the cake comes out clean. When cake is out of the oven, immediately invert the tin and leave the cake in the tin to cool completely (about two hours). Whip the cream, sugar and vanilla in a bowl until stiff, be careful not to overbeat as the cream will split. Cover with plastic wrap and refrigerate until required. When the cake is cool and ready to be assembled, run a knife around the edge and base of the cake and invert to release. Slice the cake with a sharp chef’s knife into three equal layers. Spread half of the filling and some nuts on each layer. I think in the future I would add some cocoa powder to the whipped cream, as it will help bring out the layer distinction. Layers of delicious whipped cream! Bring the cream to the boil in a small saucepan. Remove from the heat, add chocolate and whisk QUICKLY until the chocolate is melted and well combined. Reserve 1/8 cup aside. Place the cake on a wire rack and, using a spatula, spread the ganache evenly over the top and side of the cake. Use some crushed cereal to stick onto the bottom of the cake. I piped the top with some buttercream + cocoa powder. If you like, you could use whipped cream + cocoa powder too but you may encounter some difficulty since the whipped cream might not be able to withstand the weight of the oranges. Use the 1/8 cup of ganache that was previously reserved to dip into orange slices and place on top of buttercream. Results? I looove this cake! It was incredibly light and the chiffon was sooo soft! I loved the ganache too. 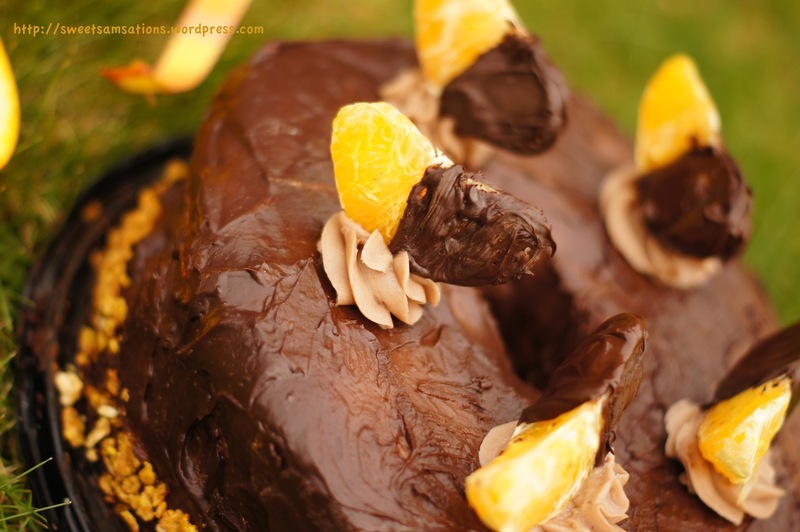 Never knew that orange and chocolate complemented each other so well! I’ve seen a lot of chocolate coated strawberries and was wondering if chocolate coated oranges would work. It did! My chiffon might not have risen as much as I liked it to, but I guess at least tall enough for me to divide into 3 layers! haha.. I gave this cake to one of my best friends Jonas, who I’ve known for almost 10 years! Now, although that may not seem like a long time to many of you, 10 years is definitely ancient to me! We went to the same high school in Singapore and came to Vancouver together to attend the same university too!! Jon’s in med school in Manila now, but he took me around Philippines when I visited last year! Now that he’s back in Van for a short visit, I decided to bake him a cake with ganache for the sweet tooth! Fun times in Manila! LOOK AT THAT SISIG!! I’m glad he liked the cake! He’s bringing it home to his family today. hehehe.. This is my second submission to Aspiring Bakers #18: Layers of Love (April 2012), a “Layered Cake” event I’m hosting this month! Please check it out if you’d be interested in participating too!! Deadline is on the end of April! A slice for a beautiful day! yay summer! bb your cake looks so cute! haha and lol on the hazelnuts. i guess this is why people buy the ones from stores here where they’re already cracked. but at least this way, you know it’s healthy because you didn’t add any preservatives. haha.. yeah!! The hazelnuts were such a pain!! Never again!!! lol.. I tried to look for some in Superstore but couldn’t find them either. Oh wells! haha.. Thank you!! So sweet of you! I love the presentation, especially those oranges on top! Thanks Kay!! My first time blending the 2 together as well! Thanks Tandy!! Yes! I hope to see your cake!! I’m so envious of your coming vacation! Seems like a lot of fun! Have a wonderful day too! I never cover ganache with a chiffon cake before, this looks so good..
hehe.. Yeah! Chiffons taste great plain too! So after watching the video I thought I’d give this a try! 😀 Thank you! Thank you! First time making chiffon, and I have to say I’m pretty much a convert now! Don’t know if I can go back to regular sponge. haha..
Yeah. The chiffons I’ve seen are always in bakeries are always plain. But if you think about it, it’s really not that different from a sponge cake, and it’s a lot easier to layer because of its height too! 😀 I agree that this is not traditional though! I am so glad I did not miss this post. Chiffon cake is a great type of cake. Always elegant and fluffy! Yours looks fabulous. I really like the light filling as well as the topping. Creative using the crushed cereal. Seeing that cake, there is no doubt that it was delicious. Tell Jon he is lucky to have such a great baker as yourself! Enjoy the day! aww! Thanks Tina!! Now that I’ve tried the orange chiffon, I’m excited to venture into other flavours too 🙂 Have yourself a nice week!! You’re too sweet!! 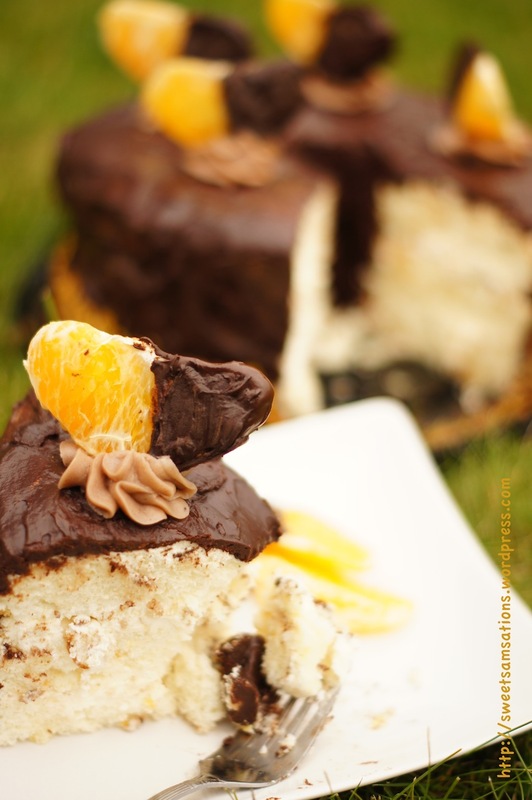 I’ve never had a chiffon cake before, it look so light and so good, even better with ganache and orange! Looks fantastic. No way I’d patience to prep all those hazelnuts! Thanks Carol!! Yeah! I regretted cracking and skinning all those hazelnuts as soon as I started them. It seemed like it would take FOREVER! lol. 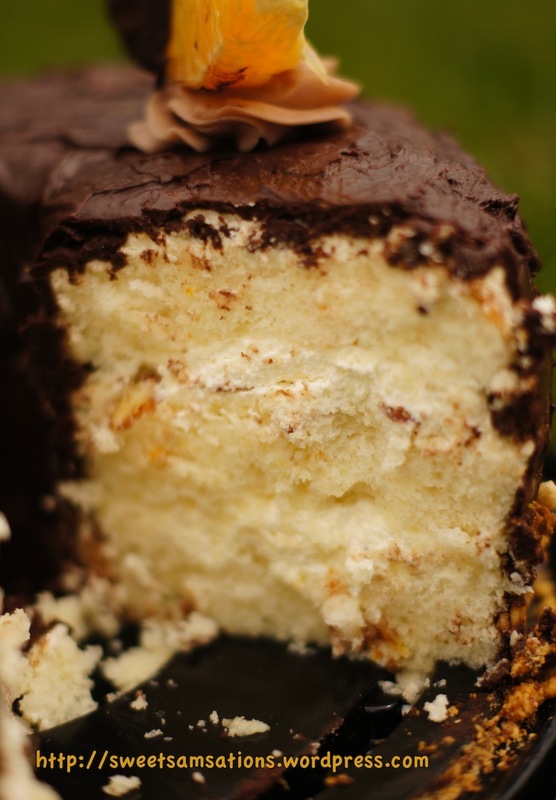 Really like the idea of the whipped cream layering and the chocolate ganache frosting. The use of coconut milk sure added a tropical touch. I’ve never made a chiffon cake – although I do love them. You make it seem – possible. I agree that peeling hazelnuts is a royal pain and in the end – some of the skins stays put! What a delicious turn-out you had. I don’t know if I could give it away! haha.. Thank you Claudia! It worked out well, because I loved the recipe so much that I made another plain chiffon for myself the next day! Of course I gave some away to coworkers and friends. lol. I think I really need to start watching my diet. hehe..
oh my, this sounds amazing! 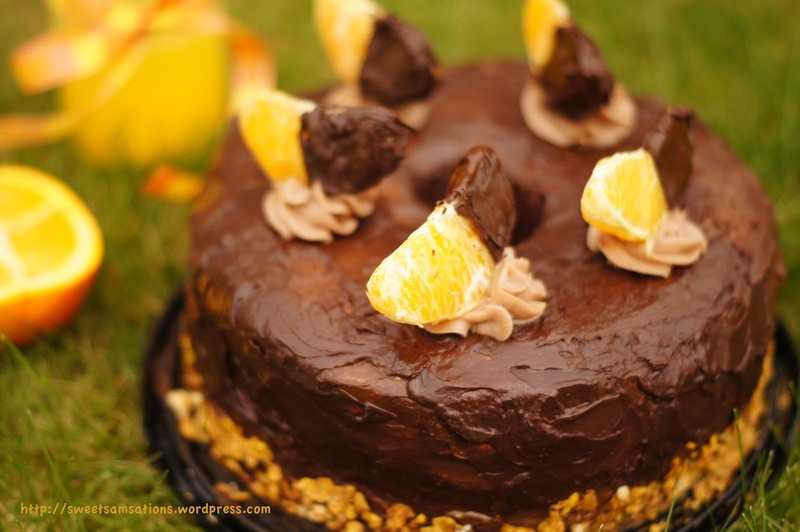 i love the combo of chocolate + citrus, so i know i would love it. you made this look so easy (except for the hazelnuts, ha!) – i’ll have to try making one for the first time soon! Thanks Amy!! Yes!! Try the chiffon for sure! Even if it doesn’t rise as much, I guarantee its texture would be soft and delish! Thanks Bam!!! Yeah, I kept questioning myself why I was cracking those nuts while I was doing it. But since I started, I thought I should just finish the job. Nope!! Failed! Good thing I had my sliced almonds at home! Looks divine! I think it was well worth the effort!! Orange and chocolate are my favorite flavor combination! You are amazing! I would have NEVER had the patience to shell all of those hazelnuts. Your decorating skills always impress me as well. So yummy. Thanks!! HAHA I know!!! I never knew how annoying hazelnuts would be. The videos all made it look so easy. THEY WERE LYING TO MEEE!! lol. I’m glad I stocked up on my other nuts as alternatives at home! What an impressive cake…looks fantastic! 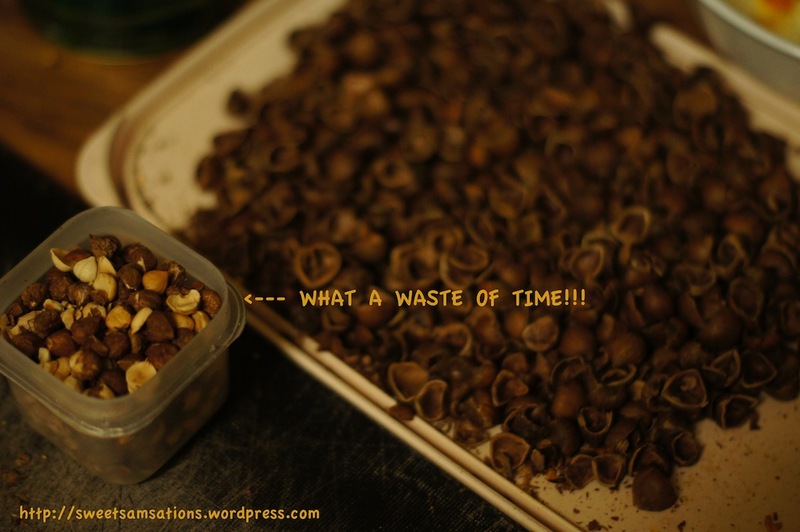 I agree with Geni–I wouldn’t have the patience to shell the hazelnuts either, haha. So kudos to you girl! Thanks Matina! 🙂 yeah, one can never have too much whipped cream! Oh yes, and this will be the last of my hazelnut cracking adventures!! From now on, it’s gotta be store bought. haha..
Haha, that is hilarious about the hazelnuts! This looks definitely worth the effort, this cake looks absolutely delicious! yeah, doesn’t it look so pathetic?! The ratio of the volume of shells to nuts are like 927085:1 lol! Thanks! Sam, this is just fabulous. Congrats on such a great cake! 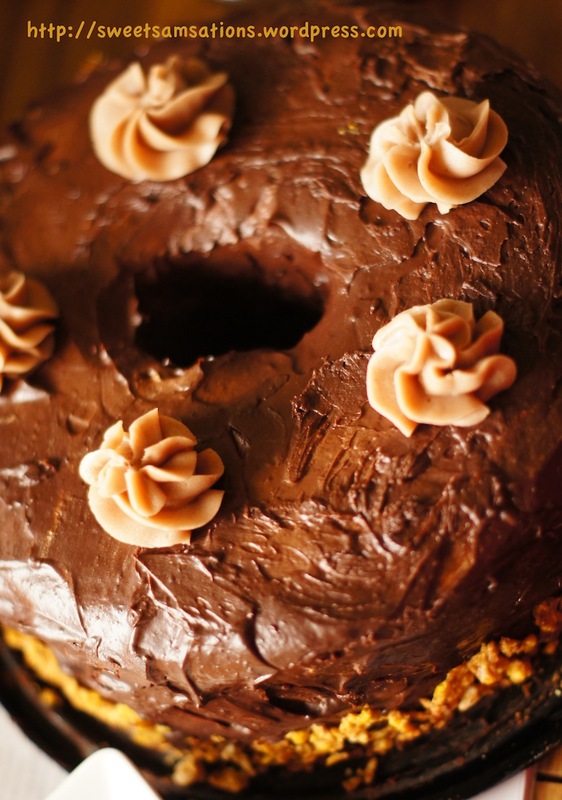 I am truly salivating looking at this with the orange and chocolate and hazelnuts….YUM! except that the hazelnuts didn’t make it! Substituted with almonds. thanks anyway! Yum, this looks so delectable Sammie. Love your decors. I wish I could eat a slice right now. 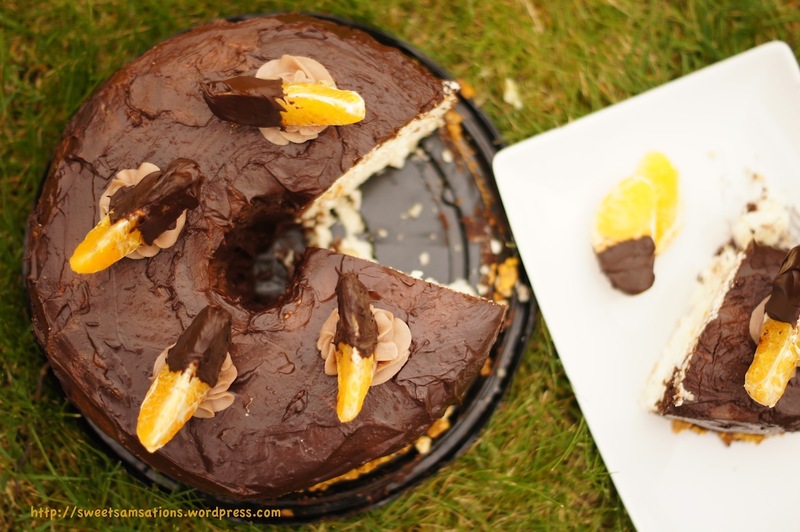 Love how you dipped the orange segments in chocolate as a garnish, too. Really beautiful! 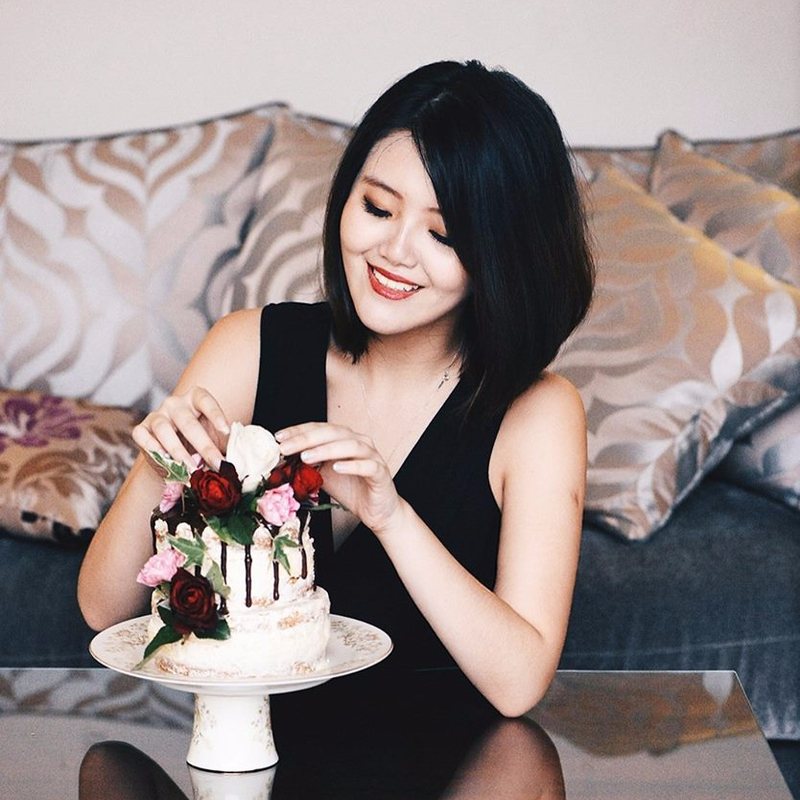 That’s one gorgeous cake S! I love orange and dark chocolate. Your cake has a wonderful texture and I’d like nothing more than to dig into it right now. Aww! Thank you!! Never knew orange and chocolate would work so well! Oh, who am I to kid! Chocolate works well with EVERYTHING! haha.. I adore a good chiffon cake, and yours looks fantastic! I can only imagine the fluffy texture with the chocolate ganache and orange flavor – definitely a winner. BTW, what a cute pic of you and your guy! Such a beautiful couple! LOL! No Lisa dear! That’s my bestie! Not my bf. haha..
I’ve actually never made a chiffon cake before but the light and airy texture sounds majorly delicious! 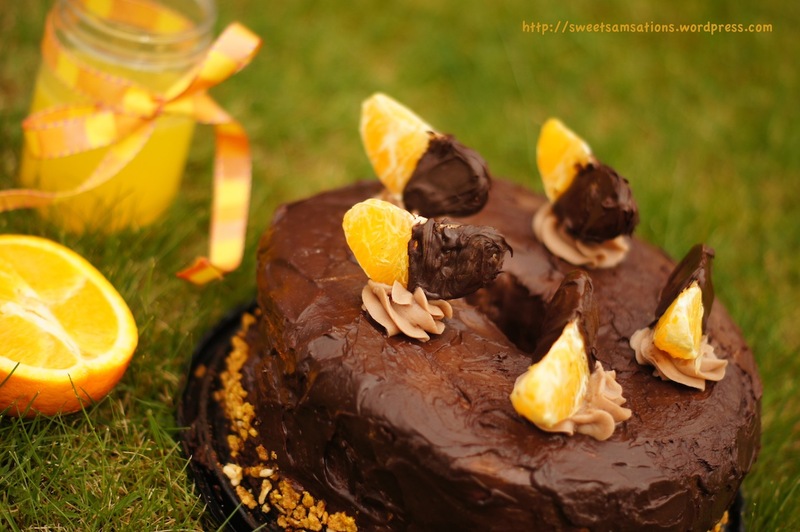 Wow, love the combination of orange and chocolate…looks delicious! You have done it again. This cake looks amazing. Very impressive work indeed. All I need is a fork and this cake and I am set. Wish I could just dig into that. Looks absolutely gorgeous! This looks and sounds like a great, decadent cake with fewer calories! But, I’ll take your advice and skip the deshelling of hazelnuts. I’ll buy the pre-chopped myself. haha.. Thanks! Yeah! Too bad they’re not as easily available as other nuts like almonds and pistacchio! 🙂 Hazelnuts are delicious though! Really, this is your first time making a Chiffon? Your beautiful cake definitely doesn’t look like it! And so funny you had to sit for 2 hours for racking and skinning the hazelnuts! Great job… haha. Well I bet it was all worth it! Thanks Nami! I know! I felt so silly peeling and cracking the nuts! 😦 but I’m glad the cake was fine without it! Looks delicious! What’s the chiffon term though – is it a process or something? Oh I totally feel you on the hazelnuts! I’ve never baked with them but I have used them for stuffing/dressing. 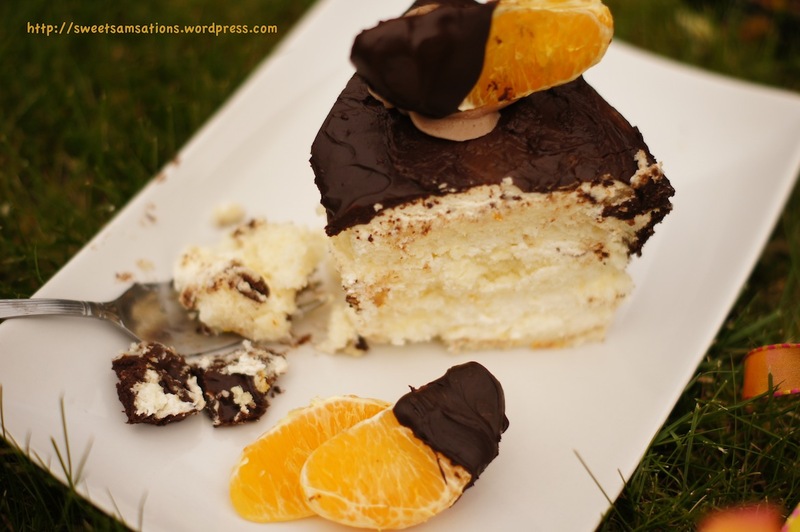 I did it one time then swore never again – I buy the preshelled ones now 🙂 I love that you did both orange and chocolate – wonderful combination for the cake! Thanks Justine!!! Aww! That’s so kind of you to say that!! I’m glad you like it! P.S. Natural lighting is the best! yay for summer! Lol I was thinking the same thing last night when I was photographing the pizza I made for my hubby and I for dinner. The lighting was still perfect, despite it being after 7 pm! Oh my gosh, girl, this cake is gorgeous!!! But you know I was looking at the photos and the lush green grass, and I was thinking how stressed out I would be about setting my beautiful cake down in the grass- I would be terrified a bug would try to sabotage my efforts. Gorgeous results, though! Totally worth all your efforts! LOL!! Omg, Heather you are SOOOOO right! I wanted to do my photography a little differently this time, and thus decided on a green grass background with some orange juice. Since lemon juice / orange juice bestows a “nice warm weather” perception – hence the grass! But for some reason, it didn’t occur to me that the cake wasn’t just popular with humans, they were popular with ants too!! Good thing I saw them before they got to the cake and was able to “ward” them off. Yep! Didn’t spend too much time on this photography session!